alaTest has collected and analyzed 30 reviews of Sony HDR-CX106. The average rating for this product is 3.9/5, compared to an average rating of 4.1/5 for other Camcorders for all reviews. People really like the design and size. The image quality and portability also get good views. Many are less positive about the durability and battery, while reviews are divided on the zoom. We analyzed user and expert ratings, product age and more factors. 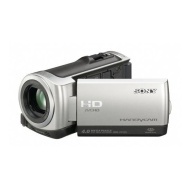 Compared to other Camcorders the Sony HDR-CX106 is awarded an overall alaScore™ of 77/100 = Good quality. No light, and quality in dim light/night isn't great and quite grainy. No separate battery charger. The size and ease of use make this camcorder an ideal companion that is ever ready to capture memories in a shareable form in full HD. With the advancement in SDHC memory technology I question Sony's insistence on the use of their expensive proprietary memory stick. Exellent picture quality and very easy to use. I just wish that Sony back off with their persistent demand that we use their expensive memory stick. But perhaps this is more of a nit-pick than a bad point because albeit with reluctance, I can live with this situation. Small camera with impressive functionality. Intuitive to use.